This collection is diverse in both color and finish. 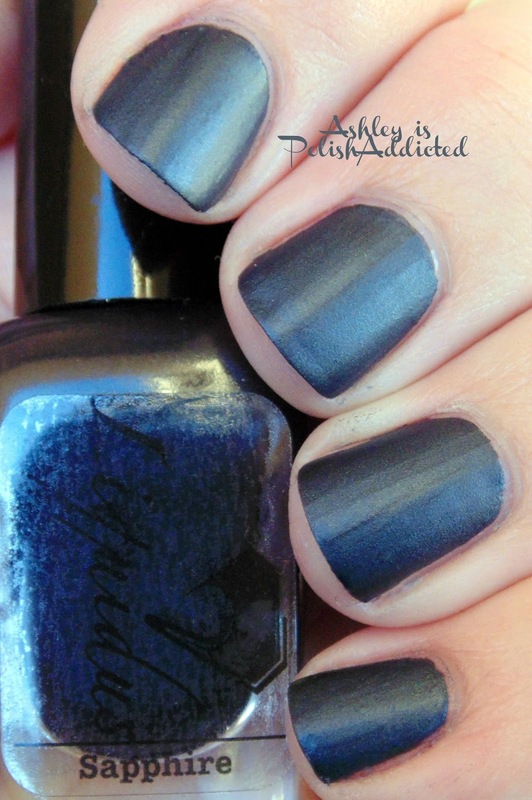 It features a matte with shimmer, a metallic shimmer and a jelly. 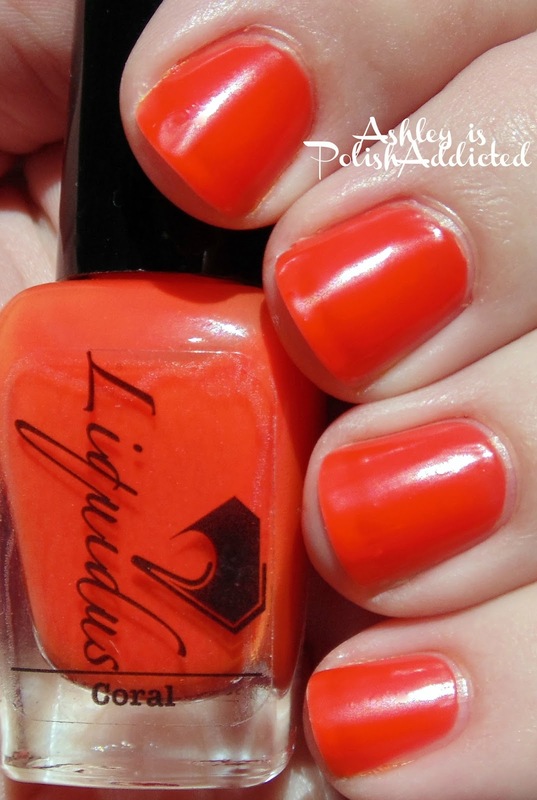 I love Liquidus' jellies - they are usually my favorites from each collection! 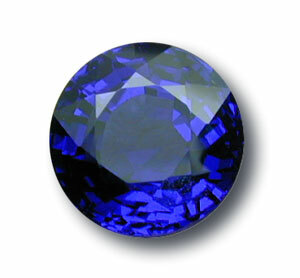 Sapphire is a deep black/navy blue with a matte finish and gorgeous shimmer. I love matte shimmers and this one is no exception. This was 2 easy coats and no top coat. 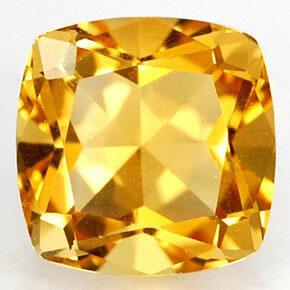 Citrine is inspired by the birthstone of November, which is my birthstone! 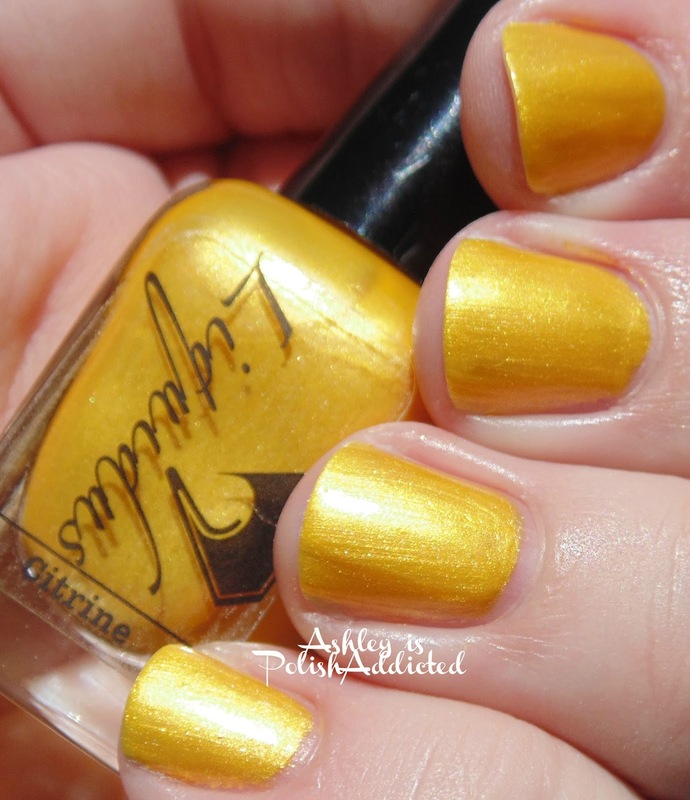 Citrine is a bright yellow gold shimmer. It is slightly brushtroke-y due to the finish but nothing problematic. This is 3 thin coats and no top coat. Coral is inspired by the coral gemstone and it is a super bright, in-your-face orange jelly! This one is my favorite of the collection. But that shouldn't be a surprise if you have been following me long. This is 3 thin coats (although I think it would be opaque in two regular coats as well) and no top coat. I really love Liquidus Nail Gloss. The polishes are inspired by rocks, minerals and gemstones and since I used to collect rocks they still hold a special place in my heart. There is no beauty that is equal to nature. The polishes reflect that and come in a wide variety of shades and finishes (and all packaging is recycled and biodegradable!). Which ones will you be picking up? If you want to grab these, or any other Liquidus polishes, I have a sale code that is good for the next 2 weeks! 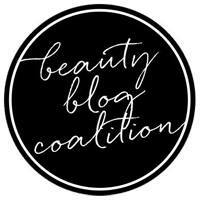 Use code POLISHADDICTED10OFF through July 14, 2014 to save 10% off your order! 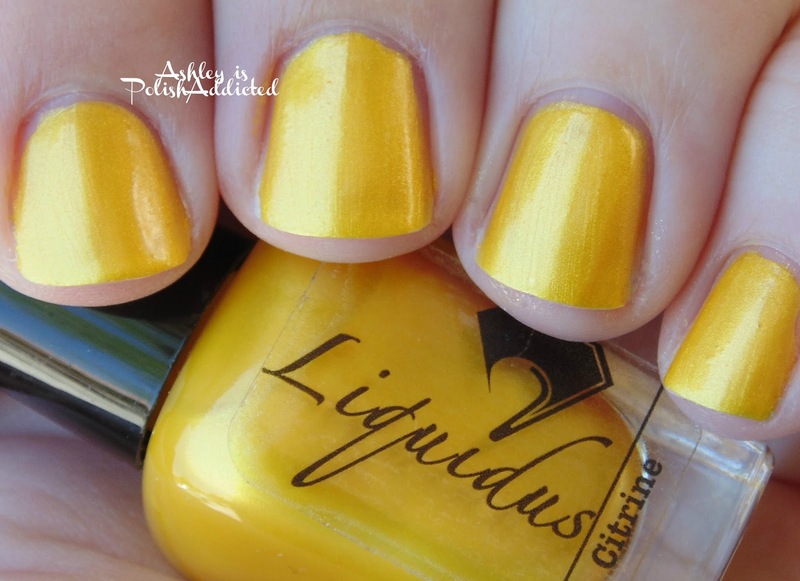 Liquidus polishes retail for $9 for full size bottles and $6 for minis. Make sure to check out Liquidus at all of the links below! 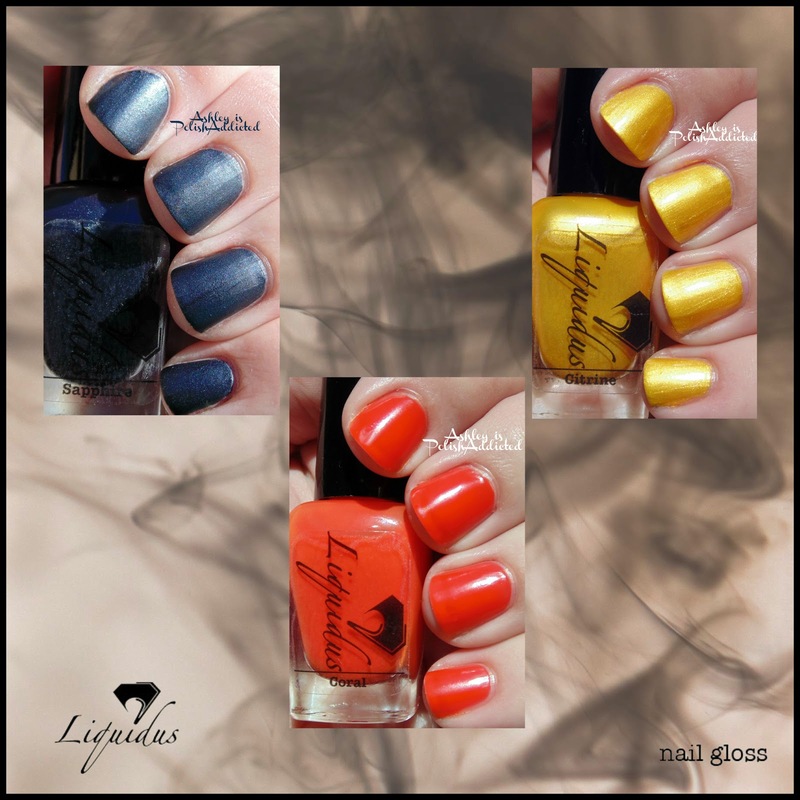 Your manis & photos show the true beauty of these colors! These are going on my wish list because of your fabulous review!